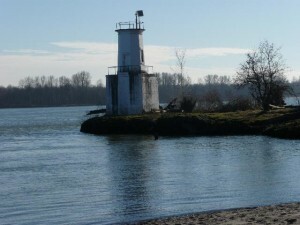 Warrior Rock lighthouse helps guide river traffic on the Columbia River. It once contained the Pacific Northwest’s oldest fog bell. It is Oregon’s smallest lighthouse, and one of only two Oregon lighthouses still operating which are not on the Pacific Ocean. U.S. Congress authorized a lighthouse for the site in 1888. The structure was constructed in 1889 as a small, wood frame building atop a sandstone base; it had living quarters below and an oil lamp beacon light with lens and a hand-cranked fog bell on top. The light was placed to warn of a bedrock reef which projects into the Columbia at the east tip of Sauvie Island. The fog bell was cast in 1855 in Philadelphia and first installed at the Cape Disappointment Light at the mouth of the Columbia River when it was retired for a louder model. It was subsequently installed at the West Point Light in Seattle, but removed in 1887 to make way for a steam whistle. It was installed at Warrior Rock in 1889. Lightkeepers used a skiff to approach the island from St. Helens, and the lighthouse itself in times of high seasonal water. The 1920s-era lightkeeper rigged an aerial cable to get to the lighthouse from the keeper’s quarters during such times. The wooden house was replaced with a 28-foot (8.5 m) tall octagonal concrete tower in 1930 on the original sandstone foundation. Around the same time, the light was electrified. The site was an official water level gauging station in 1937 and 1938. The lighthouse was struck by a barge on May 27, 1969, destroying the foundation and disabling the light and bell. While the Coast Guard was evaluating whether to repair or replace the tower, the fog bell was removed. It fell into the river and cracked, putting it out of commission. It is now outside the Columbia County Courthouse in St. Helens, close to a half-scale replica of the original Warrior Rock Light without foundation. The lighthouse presently operates with an automated beacon and bell. The exterior of the site is open to the public, and can be visited by a three-mile (5 km) hike from the north end of Reeder Road. Reproduced from Wild in the City, A Guide to Portland’s Natural Areas, published by the Audubon Society of Portland. Available at the Audubon Society of Portland’s Nature Store (www.audubonportland.org) and in area bookstores.